We are all at risk if we don’t begin the process of securing our security and surveillance devices and internet connected convenience devices. The mobile app’s that provide access to our home & businesses internet connected video security are becoming easier to set-up. But the cost of easy setup is often your network’s security. Online security and surveillance devices are an attractive target for hackers, who scan devices for security vulnerabilities and then install malicious software. Once a hacker has access to your network they can interfere with the operation of your video security device, install a DDoS bot and gain access your computers and electronic devices on the same network. The Department of Justice offers insight into Securing Your “Internet of Things” Devices with a well written guide that you can download and print. The DOJ explains this issue thoroughly in the introduction followed by several precautions. Here is an example: “If you determine that your IoT device has been compromised by Mirai or similar malware, turn it off and then on again after several seconds to purge the device’s memory, as instructed above. Malware, such as Mirai, often resides in an IoT device’s memory, so purging the memory will remove the malware. If your device was compromised because of poor password management, change your password and follow good password management practices as described above before reconnecting it to the Internet. If you suspect your IoT devices has been compromised, we encourage you to file a report regarding your with the Internet Crime Complaint Center. You can find them here : https://www.ic3.gov. More on how to protect your internet connected video security system. 10 ways to avoid hacked security cameras in your home or business. Keep your video security cameras & other internet connected devices firmware current. 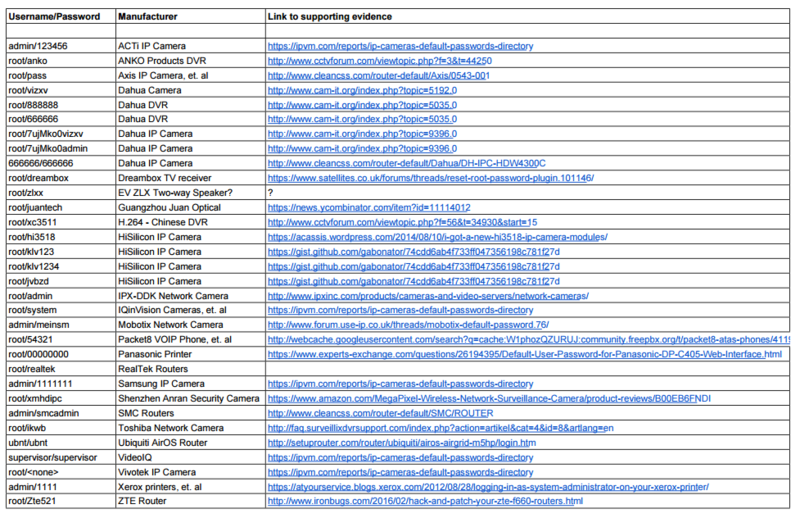 You can find links to technology companies firmware here. Choose strong passwords and a different password for every device. Immediately change your IoT device default username and password! As Brian Krebs from the blog krebsonsecurity.com points out, they are listed everywhere. Set a strong password. We listed this twice because it’s too important to only say once. Don’t be lazy when choosing a password. abc123 or 123456 will be hacked in seconds. Do you trust your security camera manufacturers cloud storage or peer-to-peer service? Many of the largest security, networking & technology companies have been compromised too. Combine uppercase, lowercase letters with number & special characters to form a word or phrase that is at least 10 characters in length..
To assist you to remember your password you can use character substitution to create a strong, secure password. This is called a “Munged Password” (Modify Until Not Guessed Easily) replace letters with numbers & symbols. For high-security applications, this may not be effective. It is certainly better than using your street address or wife’s birthday. Further reading on securing your internet connected video security and IoT devices. Microsoft has some solid advice for those who have more than a basic understanding of how network connected video security operates over the internet.